Welp, last week was exhausting, and this week–and today, specifically, in which I worked a bit over ten hours at the day job–hasn’t been much better, though it has been slightly more productive. Only slightly, though, and most of that productivity was expended on selecting blog material for the Hugo Award voter’s packet and putting it together in ebook form. Plus reading Space Opera, which is the first perfect book I’ve read this year. Now I’ve moved on to A Princess in Theory by Alyssa Cole, and it is delightful and exactly the sort of light read I needed after Space Opera. This coming week is probably still going to be busy and tiring, so I’m not sure what I’ll be able to accomplish. In spite of my desire to work more like 25 hours a week, I’ve been working pretty much full time the last few weeks, which is a huge barrier to blogging. Even just consuming media has been more than I’m up for most days, and the sort of active critical engagement necessary for writing is mostly completely beyond me right now. I’ve also got a lot going on, just in general. This week, on top of work, I’ll be busy planning and executing my daughter’s birthday party (she just turned 15, which makes me feel a little old), taking her to a doctor appointment, and trying to squeeze in an appointment for me to get my hair cut and colored (thinking of going platinum). Tomorrow, I think we’re going to see The Cat Returns, and Wednesday my daughter’s a cappella group has a performance. Fortunately, even if I’m not being productive, plenty of other people are, so I’ve got two weeks’ worth of links to share. I still haven’t read Ilana C. Myer’s first novel, Last Song Before Night, but the more I read about her new book, Fire Dance, the more I think I ought to carve some time out for it. Ilana C. Myer on when to stop researching and start writing. Myer’s Favorite Bit of Fire Dance. An interview with the author at Black Gate. Myer’s guest post at Uncanny on three images that helped inspire Fire Dance. Breaking the Glass Slipper has Five Questions with Martha Wells. The next book in Wells’ Murderbot Diaries, Artificial Condition, comes out May 1. Catherynne M. Valente shared her Big Idea last week as well as five things she learned writing Space Opera. Did you know there is a collection of short fiction inspired by Justina Ireland’s Dread Nation? Fantasy Faction interviewed Ruthanna Emrys about her upcoming Lovecraftian novel, Deep Roots, the sequel to last year’s Winter Tide. Catch 6 Books with Emma Newman over at nerds of a feather. You can also find Emma Newman this week being interviewed at The Illustrated Page. Also at The Illustrated Page, an interview with R.F. Kuang, whose debut novel, The Poppy War, just keeps creeping up towards to the top of my TBR even though it sounds much darker than I’ve had much taste for lately. At the Book Smugglers, Michael R. Underwood talks inspirations and influences for Born to the Blade. Matt Wallace talks about finishing up his fantastic Sin Du Jour series. Jeanette Ng writes about reclaiming classics for today. L.D. Lewis’s novella, A Ruin of Shadows, comes out this week. Preorder it! I did! If you aren’t convinced yet, be sure to read this Q&A with the author over at Dancing Star Press. Ann Leckie’s 2019 fantasy novel, The Raven Tower, has a cover. So does Ana Mardoll’s first short fiction collection, No Man of Woman Born. Read an excerpt from Micah Yongo’s Lost Gods. Bogi Takács kicked off a new series on QUILTBAG speculative classics over at Tor.com. FIrst up: The Gilda Stories by Jewelle Gomez. Also at Tor.com, an appreciation of Ellen Datlow and Terri Windling. Emily Asher-Perrin breaks down the myth of Robin Hood. Chloe N. Clark’s Horror 101 series continues with a look at Private vs. Global horror. Atlas Obscura asks (and answers), why do fantasy novels have so much food? It’s time for Fantasy Book Cafe’s annual Women in SFF Month again! Renay from Lady Business started things off with a post about reading challenges and reading diversely. Cass Morris wrote about historical fantasy. Kim Wilkins shared her memories of falling in love with Princess Leia. Peng Shepherd shared the book that served as her gateway to the genre. Rowenna Miller wrote about women and the authenticity falsehood in fantasy. R.F. Kuang shared a Chinese legend and what it means to her and how it influences her work. Melissa Caruso talks fighting in ballgowns. Ausma Zehanat Khan expounded upon the main theme of her Khorasan Archives series (which, incidentally, led to me finally ordering the first book). Jeannette Ng offered a taxonomy of fairies. Claire North had some thoughts about strong women. Well, today has been a Day, and it comes at the end of a Week. Readers, I am worn out. I’m also disappointed that I didn’t get nearly as much accomplished this week as I’d hoped to, but mostly I’m just ready to go to bed, even though it’s only 9:30. Fortunately, this coming week finally sees my availability change go into effect at the day job, which means far fewer too-early nights and hopefully much more productive time in the afternoons and evenings. I did manage to read a couple of books this week–Justina Ireland’s Dread Nation (it’s great, and you should be reading it right now instead of this) and The Merry Spinster by Mallory Ortberg (also good)–and I watched Jesus Christ Superstar Live, which was excellent. I also managed to get out my Spring Reading List, and I’m doing some Gormenghast re-reading as well so that I can get back to work on that project this week. It was also my partner’s birthday on Thursday, as well as my day off work, so we had a nice day together and a good dinner at a good local pizza place. Mostly, though, I’ve been working and tired from work, which seems to be the story of my life so far this year, and even I’m getting bored of it. That said, I’m stoked to be getting back to work on Gormenghast, and I’m cautiously optimistic that I’ll be able to write about The Expanse, season three of which starts this Wednesday, and Into the Badlands, which is back on in two weeks. And speaking of Gormenghast, it looks like it may be getting another television adaptation. Meanwhile, Orientalism is Alive and Well in American Cinema. Molly Ringwald looked back on the movies she made with John Hughes and how her feelings about them have changed in the era of #MeToo. It makes sense that current criticisms of Ready Player One would be part of a cultural shift in response to Gamergate. Tor.com is giving away the ebook of All Systems Red by Martha Wells for FREE through April 10. It’s fab, and you definitely want it if you don’t already have it. Check out this World Sci-Fi Storybundle. It’s fantastic. Justina Ireland was profiled at Vulture. Catherynne M. Valente shared her Favorite Bit of Space Opera. Mythcreants points out 6 illogical genre aesthetics. This is something I struggle with, to be honest, but it’s okay to give up on mediocre books (because we’re all going to die). Mary Berry is going to be on a new cooking show on BBC One! I am very slowly starting to get hyped for this Han Solo movie, in spite of myself. Tonight, for the first time, I admitted to my partner that I want to go see it at the theater. The big news this week, obviously, is that SF Bluestocking is now a TWO TIME Hugo Finalist in the Best Fanzine category. The novelty of typing those words has still not worn off yet, though from now on I’ll probably keep it to myself. Thanks so, so much to everyone who nominated me; you are all The Best, and I love you. After a shaky start to this year, what with life things happening and so on, I’m finally starting to feel like I’m being somewhat productive. I’ve gotten together an ebook version of my 2017 Let’s Read! Gormenghast posts, so watch for that this week, with new Gormenghast content to come, if not this week as well, then next. I’m also putting the finishing touches on my Spring Reading List as well as a look at my favorite reads from the first three months of 2018. This week is my final week of 5-sh in the morning start times at my day job, so I’m not making any set-in-stone promises about content, but after this my schedule will be much more reasonable and conducive to sleeping and writing and having some work/life balance, so while I don’t think we’ll see a return to my days of covering three or four television shows (plus books and the occasional movie) each week, I am hopeful that I’ll be back to some kind of regular blogging schedule. I’m even tentatively planning to cover The Expanse and Into the Badlands when they start back up in the coming weeks; I think I can handle one Wednesday show and one Sunday show, even if my posts end up being later than I’d prefer. My second favorite thing this week is that one of my favorite books of 2017, Tansy Rayner Roberts’ Girl Reporter, won TWO Aurealis Awards and a Ditmar Award. R.J. Theodore shares her Favorite Bit of her steampunk first contact novel, Flotsam. Theodore also wrote about five things she learned while writing Flotsam. And here at SF Bluestocking, I’ve got a guest post from R.J. Theodore where we’re also giving away a copy of the book. The Nerdist has an interesting guide to the film references and influences of The Last Jedi. Good news: Matt Wallace is writing an epic fantasy trilogy! The bad news is that we won’t get the first book until Spring 2020. Jane Yolen’s story in verse, Finding Baba Yaga, has a cover. S.B. Divya’s novella, Runtime, has been optioned for film and television. Yes, please. Apparently Ursula K. LeGuin did a folk/electronica album. The Fandomentals continue their indepth analysis of Game of Thrones season seven with a look at events in King’s Landing: Part 1 (Recap) | Part 2 (Analysis). There are violent rabbits in the margins of some medieval manuscripts, and you can click this link to find out why. “The Male Glance” is a must-read essay. Well, this has been another week in the life. While I haven’t posted here, I did actually have a productive three days in a row off work (potentially the last such lucky even for a while to come) during which I have actually been writing some stuff and reorganizing my schedule and trying out a new reward/incentive program for myself in order to encourage productivity so that I can get back to writing and posting more soon. While this new system of doing things hasn’t paid off in any big way just yet, I’m already feeling encouraged. If nothing else, my mood has immediately improved, and I’ve been steadily checking things off my to-do lists, which I’m now doing daily and limiting to just a handful of good, reasonably accomplishable tasks. I’m hoping that this is going to be the long term motivational time-management and accountability tool I’ve been so desperately in need of. My first big project under the new system is actually the resurrection of an old project. Last year, I began a detailed read-along of Mervyn Peake’s Gormenghast books, but I only made it about halfway through Titus Groan before getting derailed by life stuff and a nasty bout of depression, but it’s actually the 2017 work that I’m most proud of and I think it’s worth returning to and finishing. Plus, I figure it will be good for me to work for a while on something that’s really not time-sensitive. The other most-rewarding work I do is television recaps and reviews, but I foresee it being a challenge to keep up with those while working full time. That said, new seasons of both The Expanse and Into the Badlands are starting in April, so we’ll see how things go. In the meantime, however, GORMENGHAST. If you haven’t read my previous Gormenghast posts, I should have a convenient (and free) ebook of them out by the end of this week, and I’m hoping to have new posts starting next week. 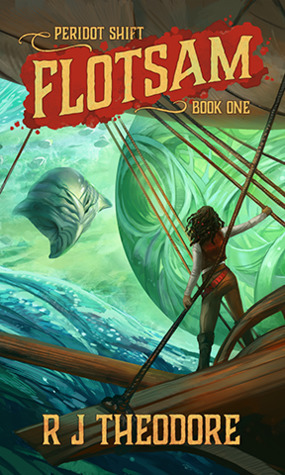 Finally, be sure to check back here at SF Bluestocking tomorrow, where there will be a guest post by R.J. Theodore, author of the steampunk first contact novel Flotsam (out Tuesday from Parvus Press) as well as a giveaway of a copy of the book. The finalists for this year’s Kitschies were announced. Heroine’s Journey, the third book in Sarah Kuhn’s excellent superheroine series, has a cover, and it’s fab, but the somewhat bigger news is that there are going to be more books in the series: three more, to be precise, plus a novella. L.D. Lewis revealed the cover for her upcoming short story, A Ruin of Shadows, set in the same world as her much-praised “Chesirah” (in the first issue of FIYAH Literary Magazine). Margot Robbie is going to be producing a female-led Shakespearean drama series.